The Wedding Gown Preservation Kit has helped over 3 million brides across the nation. The Traditional Wedding Gown Preservation Kit is the nation’s #1 top selling service for brides to have their wedding gowns professionally cleaned and preserved. Our world class SYSTEMK4 wedding dress cleaning technology removes both visible and invisible stains from your wedding day and protects your dress against future yellowing. 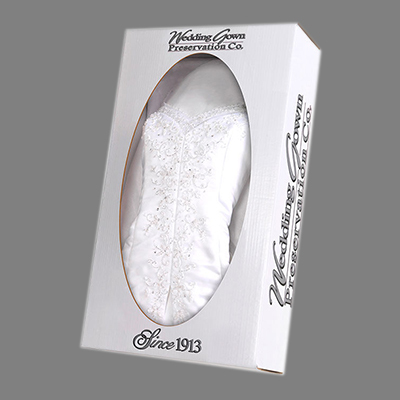 Our low price includes sales tax and also includes complimentary 2-way shipping of your wedding dress to the Wedding Gown Preservation Company to receive its museum quality preservation. Also included is $500 of insurance for the trip to ensure your gown is safe at all times.